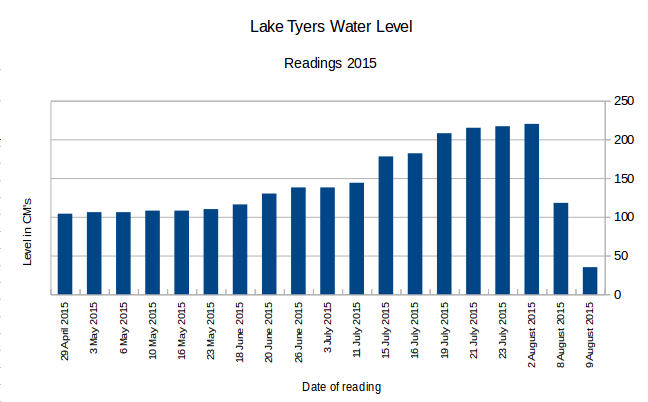 There is finally a reference point when it comes to letting you know how much water is in Lake Tyers is at the moment. We have had good rains so far this year and the lake water is in excellent condition. Summer is now around and we will have to wait for Autumn rains to top it up again. The water is low, but the condition is perfect. However the rain measured at Lake Tyers Beach, at the most southern tip of the lake does not reflect the catchment area to the north of the lake (about 20km Northwards) and the area feeding Boggy Creek. Consequently the smaller rainfall episodes measured on the right will only have a slight correlation with lake rises. Wide spread very heavy rain episodes though will be more representative. Here is the Rule in action, with the Official Rule Reader!!! Who said "We will never use Maths again"? 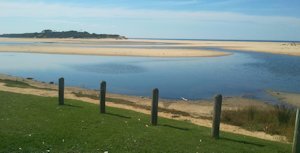 How much water is in Lake Tyers? 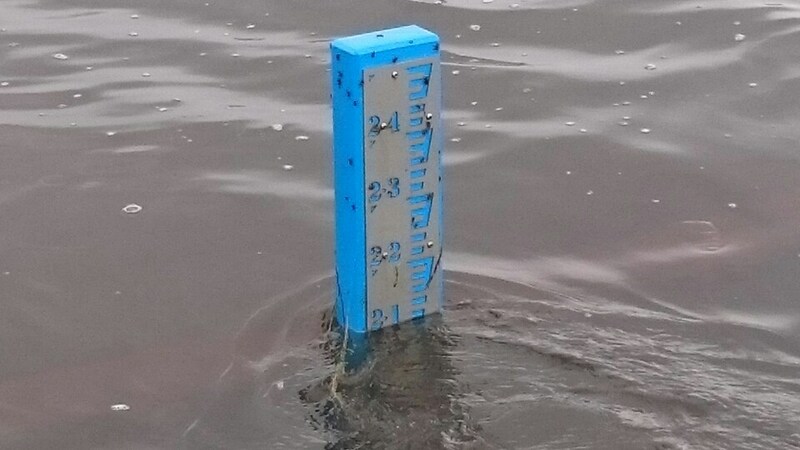 How deep, or what is the lake level at? It is quite difficult to say what the depth of a small-ish lake is when there there is no "mean tide" level to work against. So what ever level is given here is just general advice and needs to be qualified by any local experience you can glean when visiting. The level for a 'break out' through the sandbar on the current rule at Nos2 Boat Ramp would be about +220cm (as an educated guess). 2019 -18cm -6cm The last month has seen very little rain, and for the last three weeks we have definitely had only a couple of light showers that barely settled the dust. The sandbars around the islands in the lower lake and behind the bar are growing by the day and bleaching white. The islands are nearly all connected so technically no longer islands!!! The depth at Number Two ramp is becoming a problem. The launch depth is ok, but there is a mini bar behind it thrown up by people using their motors to get their boats onto their trailers. So if you have a bigger boat you may like to check it out and plan ahead. 2019 -6cm -12cm We have have had consistent small amounts of summer rain. Each time barely enough to settle the dust, but welcome all the same. There is much more of the sandbars exposed in the lake and the algae bloom (the good green stuff, not the blue green) has passed. 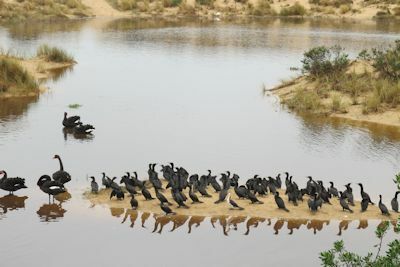 The lake appears in good condition as the low rainfall has ensured there has been little runoff from the surrounding bush, though this must be taking its toll on how much 'feed' comes into the lake as well. Our rainfall pattern appears to have shifted from pretty wet winters, that filled the lake, and dry summers, to mildly wet winters and summers. This makes a fill and break out of the lake very unlikely. 2018 6-7cm None The small amount of rain recently has not raised the level of the lake at all. It has flattened out the ever increasing sandbar out in front of the Tavern. There are points around the inside, the lake side of the sandbar that weep water back into the lake. I am guessing this would be coming from the ocean through the sandbar. After 2 years without a breakout the sand would be most likely clogged and not be very porous, but given how low the lakes is some must be making it through. 2018 6-7cm -3cm We have had much less rain than this time last year and have had to improvise to estimate the depth of the lake. Using a spirit level, the 50cm line was marked in several jumps out to where the water is now and a marked Aluminium strip pushed into the sand to level with the 50cm mark.This is looking like a significant drought on the way, and filling the lake this year seems less and less likely. (est'd) -28cm The rainfall has been very low and very erratic. The lake level has been falling and large sand bars have been exposed behind the main bar. These have been accentuated by wind blown sand as well. The drop is most likely because of low flows from the catchment area and high evaporation. However the lack of sea water coming through the bar may indicate that the bar has sealed and further rain may cause the level to rise and not leak away so easily. The level on the rule is covered by rocks and sand so the 10cm is an estimate. 2017 38cm +4cm We had a big downpour by recent records. 65-70mm recorded over a number of days. However it has not shifted the level of the lake much at all. It may have been the very dry undergrowth, or lack of really heavy rains in the catchment area, whatever happened, the rain and some run in from the surf (we had spring tides and onshore swell yesterday) did not make much difference. Hopefully it will have freshened up a few people's tanks, dams and water storage for the long haul over the summer. 2017 34cm +2cm We have had 122mm since the 22/8/17 (below) and yet the lake has not risen significantly. The rate of incoming water versus losses by seepage (through the bar?) and evaporation have cancelled it out. More big Spring type rains are possible, but the earth is so dry at the moment it would take a really sever storm or a fortnight of heavy rain to get the run-off required. 2017 32cm +2cm We have had about 30 mm in the last fortnight, but this has barely wet the topsoil and litter, so a long way to go before any significant rise in the lake. 2017 30cm 0cm Too little rain and when it does come it maybe too late to force an opening this year. Things are looking pessimistic since Easter. Last year 1June to Aug8 2016, we got 120mm, this year we have got 25mm during same time span! About a fifth! This spells out a serious warning, drought?? 2017 20-30cm +10cm We have had very little rain this year. Most of it was scattered with only downpour that was bigger than 20mm. Consequently ground is very dry and any rain does not lead to significant runoff that could lift the lake level. We will need some big storms soon if the sandbar is to be broken this year. 2017 10-20cm -10cm The lake has entered the phase where it is completely cut off by the sandbar and the summer heat is evaporating the lake and rainfall is very low for this area. This will continue until the summer breaks and winter sets in. 2017 20-40cm 0cm The lake has closed for this 16/17 summer season as we see increasing rainfall it tend to rise depending how much falls in short amount of time. 26 October 2016 20-40cm Tidal A massive storm has widened the mouth and leveled off half of the dunes on the west side of the opening. The sea surge was so powerful it was running up the track at Red Bluff, and at the sandbar appeared to have made two openings to the lake. This will almost certainly make the lake stay open until around Christmas time now. 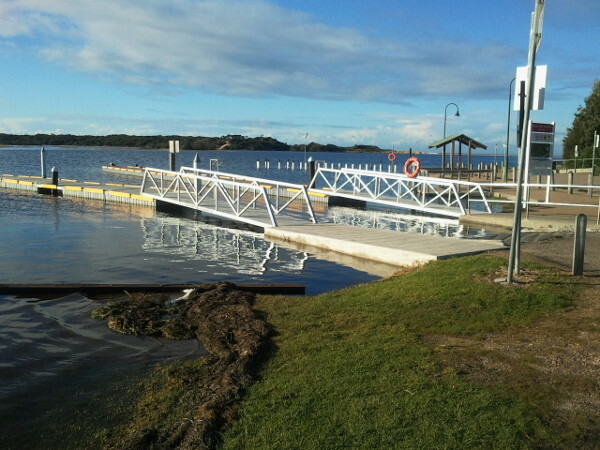 20 October 2016 20-40cm Tidal The recent rain, and probably the storms as well, has widened the entrance and will keep the lake tidal for another month or so at least. The water quality is excellent and quite a few whales have been spotted from Beacons Lookout on their way back to the northern waters. Still tidal but with the opening much narrower and could close over fairly soon. Recent rains of 100mm (approx since Jul21) have keep the lake healthy and flushing OK. Should be good for summer season. At the moment the tides are washing in and out of the lake and it is rising and falling about 20cm. The sand bars in front of the Tavern are sometimes covered and other times exposed.Clear water is reported as high as The Island. Lake opened and so we begin the cycle again, and it means the lake will be tidal again for another few months, replenishing fish stock and flushing water. Rainfall at Lake Tyers Beach was 40mm over this period, but vast quantities fell north of here with 150mm around the catchment area, eg Buchan where the caves were closed for a day due to rivers running past cave entrances. Lake opened naturally today about 8am. Boggy Creek must have been thundering down. Maybe more rain fell in the catchment, as non fell down here. So probably Boggy Creek inflow, with possibly a stormy bit washed in over the bar. About 60mm of rain arrived in stormy conditions form the SW as part of a East Coast Low and a prevailing westerly cold fronts. Last sandbar in front of Tavern now just covered. About 50mm of rain up till today with heavy showers expected. There may have been small fluctuations, but the lake has been at its lowest point now since the opening last August. We await more substantial winter rains! Sometime over night the sandbar has been breached and there is massive channel through the bar and the lake is dropping fast. 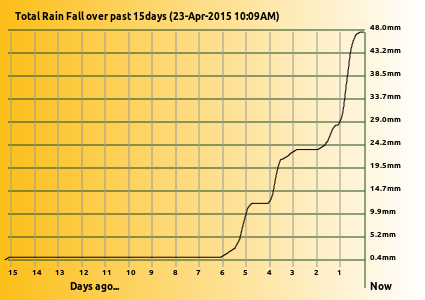 NB : Levels in the lake continue to rise at least up to 3-5 days after rainfall recorded. The Winter of 2016 30 May 2016: Well it is nearly June, and the water is officially at 25cm on the Gauge at Number Two Ramp. Annual lowest point. Most of what rain we have had, and we have had consistent good falls during Autumn, has not been any really serious lake filling storms. A couple of blows from the South East looked promising, but it is probably draining out under the sand bar about as quick as it is coming in. only a few more months opportunity for a winter opening. The lake is considerably lower than this time last year, approximately 120cm (2015) compare to 25cm now. Above is a spreadsheet summary of the readings in 2015. Sometime overnight the sandbar has been breached and there is massive channel through the bar and the lake is dropping fast. week, or calmer surface allowed more a confident reading? 2-4mm this morning, must be Boggy Creek filling it. No Rainfall, runoff in headwaters at a guess. Rainfall: 10mm, still plenty of flow in head waters to come. Rainfall: 12mm 4 days ago. Maybe heavier at Nowa Nowa? Rainfall: very little, 4mm. Mainly run-off? Boggy Creek? Alert: Do not take your boat near to the sand bar when water is high as any sudden collapse of the sandbar could see it dragged out to sea very quickly. Please heed warnings at the boat ramps. People walking on the sandbar should also be very cautious. The force of the water is extreme, and it runs very fast. +2cm No rain, final runoff? So roughly 69cm rise in the lake produced by 72mm of rain, though this will change a bit as the lake deepens, the wider banks have to be filled and the sand bars/islands are covered. Plus the leakage across the ocean sand bar is also a significant factor. With this cool weather minimising evaporation, any quick drop after this would be leakage? 24 April 2015: Just a quick update. I read the depth Rule this afternoon and it is now at 74cm. So the rains of the preceding evening, plus the run off of the previous few days trickling down (rushing down at Boggy Creek?) has added about 24cm for about 26mm of rain beginning 3 days ago. 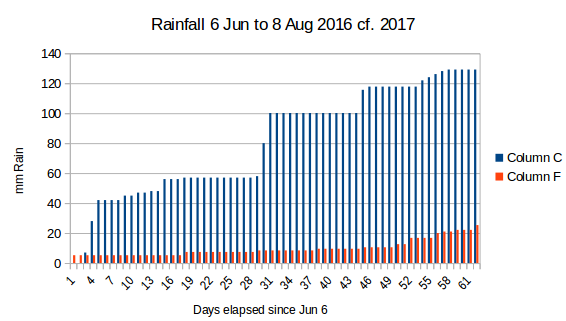 The overall total rainfall, of this recent downpour, is about 60mm, so about another 12mm added to the graph shown below. 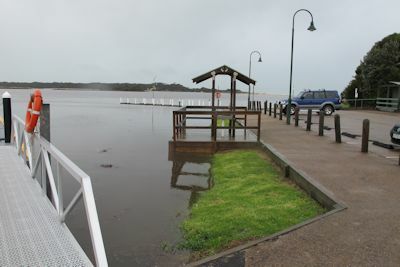 23 April 2015: The official level from the rule at Nos2 Boat Ramp is 50cm (+ -10mm) this is after 50mm of rain in the last week. The sand banks inside the lake, out in front of the Tavern car park, are just about covered, with only the bigger ones just at the water surface. So about 15cm since last reading. The 20mm rise in the last 24 hours is fairly smooth and the result of the East Coast Low that smashed up part of the Hunter and Illawara coast trickling down to us as pretty continuous, but not stormy weather. Fortunately we had a pretty strong high pressure zone come in from the GAB and it pushed most of it away. 19 March 2015: The official level at the moment is at 0. 35m at the moment and likely to stay that way at a low level for Easter holidays. However boat launching seems to be going well and no holds ups or boats grounding on the way in or out. 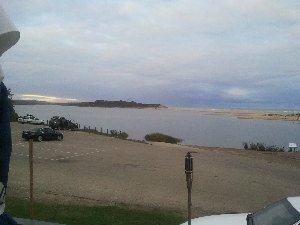 5 February 2015: Sand Bar has well and truly closed over and we are heading towards the lake's minimum levels at the moment. If there is low rainfall and high evaporation then we will see the lake drop a little lower. Leaching from the ocean through the recent sandbar and into the lake will make sure it does not go too low, but it will most likely be at a low level for Easter holidays. 20 December 2014: Algae still a problem, but plenty of tidal movement in and out of the opening so it is difficult to give an exact height. But on our new measuring board it was saying 30cm on an outgoing tide. So still quite low, but plenty of flushing going on. The recent rains about 100mm over the last two months has kept the opening clear, but also washed a lot of dark tannin water into the upper systems that is also being flushed out as well. Anglers are saying the colour is helping catches. Not so easy to spook the fish. 23 November 2014: Not much to report. The lake is still tidal and the opening is moving about a bit and laying down different little channels behind the main bar. Quite a few people seem to enjoy trying their luck fishing in the short channel that is the opening. Sorry no news on their success or otherwise (haha, would they be honest if I asked them?). There should be a few comfortable little holes behind the main bar by the time summer gets here (by today's temperature it is going to be pretty soon) for a quiet swim with the littlies. There are fairly big mats of green algae (not the blue green nasty stuff) growing quickly in the shallow waters behind the bar, and around the mud islands. Today a southerly lifted a whole lot off and it quickly travelled across the lower lake area in a northerly direction across to the Tyers Aboriginal Trust. This is a seasonal thing and will be over in a few weeks, but can be a bit daunting if you get a pile of it on your line. 13 September 2014: The lake is open and freely tidal, with the southern part of the lake showing distinct tidal rush of waters. 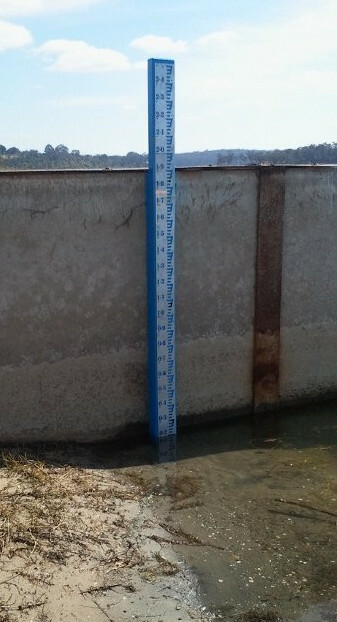 The big news is though, someone has installed an official depth measurement rule on the concrete wall at Boat Ramp Number 2. This will now become our gold plated standard for reporting on. If you don't usually launch you boat there and see the rule, you might like to visit it so you know what we are talking about. Here is a picture of what it looks like, though the significance is lost if you can't see it in the wider context. What it does mean is that between very low level as it now (0.1m) the water has to rise about to 2.1m to break out. 20 July 2014: Lake has been opened by a man with a spade and produced a broad shallow entrance. This will be deepened and narrowed by tidal action over the next weeks, until the SW to NE currents carrying sand along the 90mile beach begin to slowly close it over again. 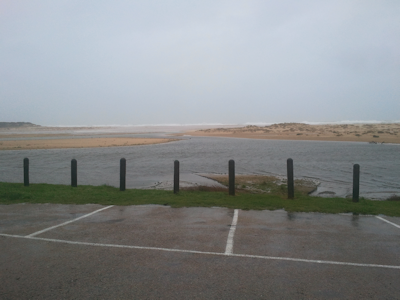 The old boat ramp near Number 2 Boat Ramp Lake Tyers Beach. The vegetation will take a while to grow back as the lake was quite high, nearly full, for a couple of months. 18July 2014: Heavy winds and seas pounding the sand bar. However it will probably need 30-40mm to push it out. Lake needs to rise about half a metre to do it. Probably only a matter a few weeks and that will turn up. However in the interim, plenty of water and fish for the persistent. 30 June 2014: Some more rain has fallen, about 10mm max this time. Just enough to keep the ground wet and any further rain likely to be mainly run off, and into the lake. The lake is not far off breaking out. Maybe another 20-30mm (lake level) might do it. One more good East-Coast Low and it will be out! 12 June 2014: We have had about 40mm since the last report and this has topped up the lake somewhat with major parts of the Mud Islands being covered and making for easy boat navigation. Fishing activity has slowed somewhat with only a few boats taking advantage of the mild weather and clear, calm days. 3 May 2014: There has been a slight drop in the lake, but still and ideal height for boating, and if one's luck or skill is good enough for fishing as well. Main ramps have been easy to use and not crowded. 14 April 2014: Well I measured it at 80mm over the weekend and I was amazed at how the lake had lifted. Opinions were varied at the local watering hole, ie the Tavern, some saying 5 feet!! others saying a half a metre. On the conservative side I would tend to say 500mm approx, but this is still a very significant amount. All the sand bars that were in front of the Tavern over Jan/Feb have been covered. Apparently there is more to come down, as the Nowa Nowa Mountain auto' rain recording had120mm and Boggy Creek is still pushing plenty of water down. What this means to the Easter fishing remains to be seen. The ground is soggy, so any more in the next week or so will lift the level even further. Stay tuned. 20 March 2014: With Easter around the corner a report on the level of the lake will not be out of order, and I am sorry to report that it is at one of its lowest times for this summer. We have had about 17mm of rain this last fortnight but it hardly made a difference, though I am sure the plants on the banks of the lake would have appreciated it. So a lot of the sand flats around the Mud Islands are exposed and water directly behind the sandbar is divided into smaller channels. The water quality is good with only isolated reports of annoying weed. However lower water usually means hotter water and less for the fish to hide in :-) plus boating people beware, less for boats!! 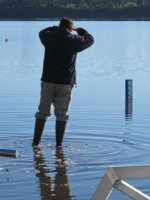 18 January 2014: We have probably seen the best of the lake depth for a while unless there is a cool change and we get some decent rains. Evaporation is revealing a few sand bars that were hidden by a few 10's of centimetres a month ago, are now peaking through the water. The large area of shallows around the islands will become gradually un-navigable even for canoes with the shallowest of drafts. There is still plenty of good water around though and the half glass full people will tell you there is less water for the fish to hide in :-) Just keep an eye out when underway at high speed that a path you zoomed over effortlessly may be a lot shallower than it was 1 month ago. 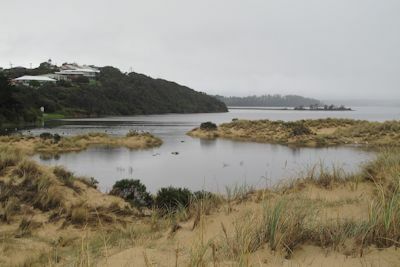 14 December 2013:The sandbar is pretty well established and the lake is relatively high, though it will decrease slowly over summer with evaporation and leakage back under the sand bar. However rain could easily top it up. We have had good rains this year generally speaking and no reason why could could get more. The fish may begin to stabilize a bit more with this closed over and the water temperature allowed to rise. 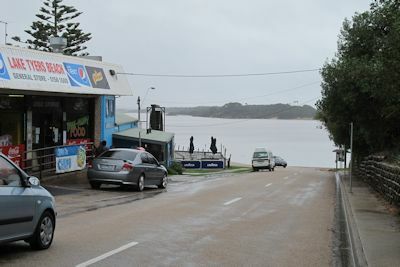 26 November 2013: The lake has continued to stay open, some heavy rains and associated storms has kept the bar open and gradually moving across to the eastern side of the bar. West to East currents gradually build san up on the West side and any strong outflow from the tides and rains tend to eat away at the east side. The water in lake though seems extremely healthy with plenty of good weed (ie not Blue Green). However with the opening nearly closed it is at a low level, and when it does close it will get even lower. 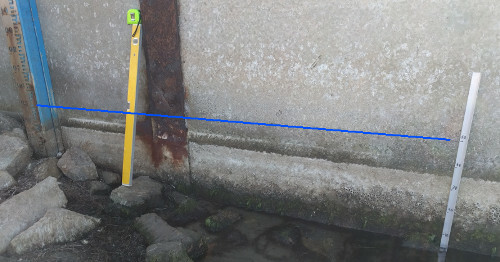 The tides keep it higher, but when it closes and the tides are not at least putting some in during high tide, it seeps out through the bar and levels out at the mean tide level, often a good 30-40cm below where it is now. The lake will not rise until either enough debris blocks the porous sand on the bar (eg algae and slime) or there is enough rain to tip the balance in favour of more water flowing into the lake from Boggy Creek than what is escaping through the sandbar. I suspect we will have a low lake over summer. 30th June 2013: The channel through the sandbar has narrowed and deepened with strong tidal flows occuring. The channel back into the lake is mainly down the between the islands and may not be very conducive to keeping the boating channels open past the Nos2 Boat Ramp or freshening up the waters in front of the Tavern car park. However the water is good and clean and definitely giving the tannin laden water from the catchment a good flush in the lower lake. To go from very, very low to break out in 5 days of rain must be some sort of depth record. 17th June 2013: Well what a downpour that was, and maybe a little more to come. The water is lapping into the Tavern car park, covering the corner of the lowest car park. 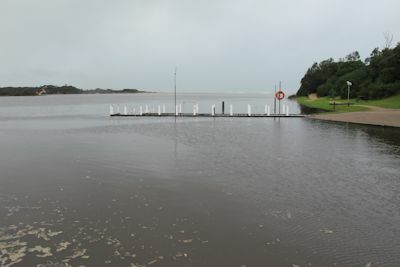 The walkway around to the beach is covered and the boards on the Number 2 Boat Ramp Jetty are just about covered as well. 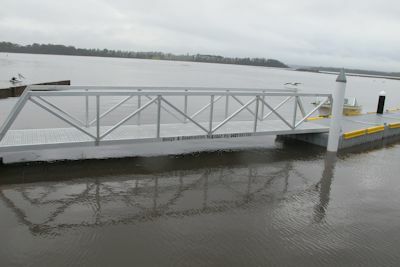 The floating jetties however are working well with the new ramps on the first section. (Wayne and Gus communicating with others). 12 hours later it broke out through the sand bar all by itself this time. 15th June 2013: Finally rain heavy enough to really lift the lake level. 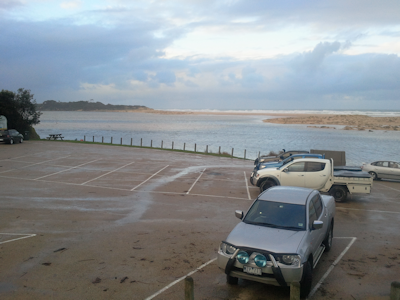 The area in front of the Tavern car park is just about completely covered with a 15-30cm of water. The big blow from the South on Friday caused the sea to wash over into the lake which will have also contributed to the rise as well. the rainfall would have been in the order of 60mm.